I’ll wait as long as I have to, as long as Daddy lets me eat the popcorn. Saturday I fell ill. It was sudden, and unfortunately I was at a spiritual retreat decorating a soul collage when it hit me. The burning sage in the air fell funny on my throat, and before long I knew I had to gracefully exit. I stopped at a CVS for sickie-poo supplies (Kleenex, Vernor’s and M&Ms) then went home and cuddled on the couch. Lex and Charlie didn’t miss a beat, and snuggled in tight. While I was drifting in and out of sleep, I had a vision. The real stuff. Popcorn seeds, oil, butter. Even popcorn salt. I couldn’t fall asleep again. The popcorn haunted me. I hadn’t made a batch in maybe 10 years. It was clear what I had to do. I counted to three, then rolled off the couch. I stumbled around looking through bleary eyes for my keys, then headed to the grocery store. It ends up I remembered how to make popcorn, and filled up a large bowl. I covered it with a quarter stick of butter and lots of salt. I turned on a marathon on “Housewives of New York City” and settled in, waiting for the rest of the cold to hit me. It wasn’t long before I realized I had company. Company interested in taste-testing the goods. In another time, when I wasn’t so wiped out, I would have made the dogs catch individual pieces of popcorn, doing tricks in the air for them, one by one. But this night, I was so sick all I could do was scoop a handful of popcorn into my hand and hold it to their snouts. They gobbled it down, gratefully licking butter from my fingers. We were having an old fashioned popcorn party. The smell of warm oil filed the house, and inspired great memories of my Grandma and Granddad. I remember eating many bowls of popcorn at their home while watching spaghetti westerns and Evel Knievil TV specials. The night began to fade. I think the popcorn bowl made it to the floor. It was a tight fit, but Lex curled up behind my legs and Charlie snuggled into my belly. 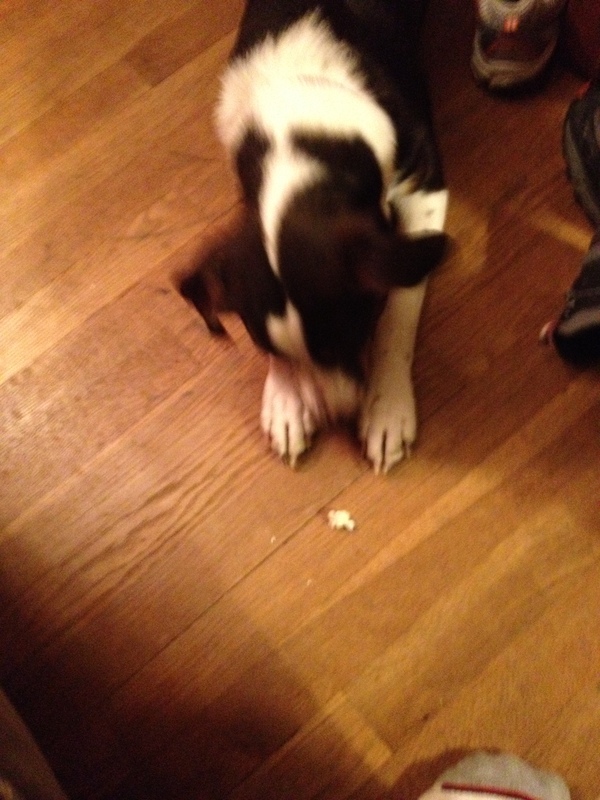 As time went on, the crumpled Kleenex fell into the bowl of popcorn, no doubt creating a disgusting dog fantasy treat. Somehow they took pity upon me, and left the pile of tissues alone. They know I’m sick as a dog, and are doing their best to nurse me back to health. Tonight Matt took pity on my sicki-poo status and decided to show off his mad popcorn skills to pamper me and the pups. Although my tastebuds are seriously hobbled, the popcorn turned out much better than my attempt. And within minutes, Matt had Charlie catching popcorn in the air. Add 3-1/2 tablespoons vegetable (soy) oil. Add 1/2 cup Orville Redenbacher’s popcorn. Turn on medium high heat. Agitate popcorn as it heats, and continue to agitate as it starts to pop. Tilt lid on occasion to let some heat out. Add butter, popcorn salt to taste. Line up dogs, aim at snouts, enjoy! This entry was posted in Health, Uncategorized, Woof! and tagged adopt, cold, dog, peppy, pets, popcorn, rescue, sick by ourfureverfamily. Bookmark the permalink. This made me want pop corn, but I hate when sticks between my teeth. This friend of mine would do caramel cinnamon pop corn, I tried to do it once, huge failure, I might try to do Matt’s recipe but it’s also likely to be a failure.